Clean and wash chicken. Take it into a bowl. 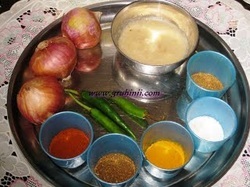 Add half cup curd, red chilli powder, salt and haldi. Mix well. Marinate chicken for half an hour. Heat 3 table spoons of oil in a pan. Add bay leaves, Saute and add chopped onions and green chillies. Fry until the onions become translucent. Now add the marinated chicken to the onions and fry in a medium flame. Chicken starts oozing out water. Fry until the chicken starts leaving oil. Stir occasionally. Now add a cup of water. Add salt if necessary. Close the lid and cook in a low flame for 15 to 20 mins. until the chicken is cooked well. Now add the grounded masala powder. Fry for few more mins and switch off the flame. 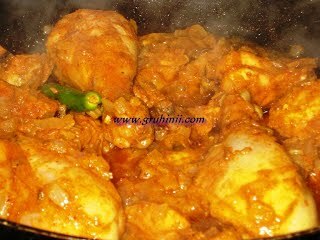 Andhra Style Chicken Masala Curry is ready..........Take the curry into a serving bowl and garnish with fresh dhaniya leaves.............Serve with steamed rice, rotis or chapatis. 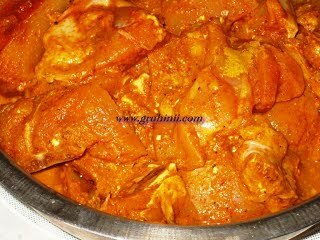 This is one of the Andhra Style chicken masala curry....Mostly prepared in Krishna district in Andhra Pradesh. 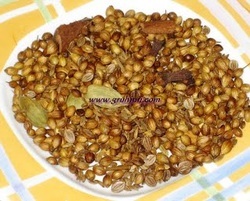 I learnt this recipe from my mother in law who belong to Krishna district.